A Large Size, Visibly Aged And Anciently Used, Nicely Polished Spade That Exhibits Surface Aging And Overall Stone Coloration Patination, Consistent Aged Surface Deposits, Correct Style Percussion Flaking, Aged Heavy Bit Polish Use Wear, Correct Shape And Surface Length Polish Wear, Correct Hafting Protection Wear, Correct Material And Manufacture For The Type. Ex-Rick Pryzgoda Collection. 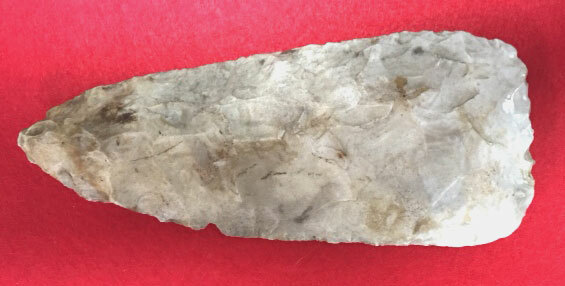 Mill Creek Chert Could Be Repeatedly Used Without Breakage Making It Especially Suitable For Mississippian Farming Tools Such As The Spade, Notched Hoe And Also Being Used For Fine Ceremonial Items! Includes Tony Putty ( Grade 9 ) And Ken Partain Certificates Of Authenticity!